After further development work this week Viezu has now released its new Range Rover 5.0 Tuning map, The Range Rover shares its 5.0 Super charged power plant with its stable mate the 5.0 XKR super charged Jaguar – a vehicle Viezu is very used to tuning along with the rest of the Jaguar and Land Rover Range of ECU remapping services we provide. 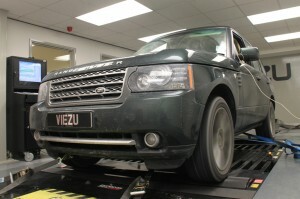 The new Viezu tuning software remaps the Range Rover 5.0 Super charged engine adding an addition 54bhp and takes the torque to a massive 630lbs ft, the ECU remap also removes the vehicles speed limiter as well, completely transforming the power and driving of the heavy Range Rover, and giving it true sports car performance. As well as Range Rover 5.0 Tuning and super charged ecu remapping, Viezu tune all Range Rover models including the new Range Rover TDV8 and TD6 diesel engine tuning, and the older 4.2 supercharged Range Rover and Range Rover Sport. The Diesel TDV8 Range Rover tunes very well releasing around an additional 65bhp, with the nice addition of around 3miles per gallon additional fuel economy Viezu is constantly developing and improving its ECU tuning services.